Bike ready to go and me looking dashing in a swim cap! So a friend of mine, Bob, who is also training for the Vineman 70.3 (OMG, it is only a week away! ), told us about a little triathlon held at a local lake and said we should come do it. My husband is just getting into triathlon so this seemed like a perfect chance for him to get his feet wet and for me to have one last run through before Vineman. So we went up this morning to give it a shot! For a triathlon run by a High School Cross Country Team it was very well organized. We paid for our registration and got checked in very efficiently. My favorite part was the hand drawn course map that showed the route for all three legs. I meant to take a picture (I have to get better about that) because the board actually showed how we would ride our bikes around the local prison! This was gonna be fun! Once we figured out the swim course and the lifeguards were in the water, we went down to get a warm up swim in. The water was so warm and clean. No need for a wet suit at all! My husband was still a little nervous about the swim (only two swimming lessons to date) but at least the water conditions couldn’t have been any better! After the warm up we finished getting our transition area set up and then headed down to the water for the start. There were only 4 waves; each 5 minutes apart. My husband’s wave was first and mine was last. I watched as he essentially swam his whole swim with his head up, but he made it out!!! Once it was our waves turn to line up I went right up front. The swim started and by half way thru I realized I was in the lead of the swim!! I was pretty psyched! The swim had to be short (4:48 for 4oo m) but who cares, I was first out of the water! I ran up the hill to transition and got my shoes on as fast as I could, grabbed my bike and got on….only to find my chain had slipped off!!! Now, I made a point to ride my bike before I racked it to make sure I was in the right gear, but some how my chain slipped. This would come back to get me in the end but I was able to correct it pretty quickly and get on the road. The ride went well. I passed many riders and was only passed by one. And how scenic to ride by the local prison! I got into transition and got out pretty fast to the run. I thought I was in first at this point because I didn’t see anyone form my age group pass me. I came off the bike and was running pretty quick, 7:30 ish. But after a mile I slowed down to closer to 8:00 min miles. 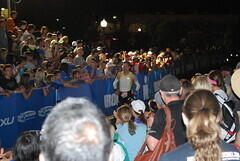 Not to long before I hit the turn around I saw a girl coming the other direction in my age group! I wasn’t in first, I was in second! I just kept running as fast as I could. A mile before the end I was passed by one more girl in my age group. I tried to keep up but I just didn’t have it. I kept her in my sights but just couldn’t catch her. She beat me by less than a minute (about how much time the slipped chain cost me!). So I ended up with third in my age group, something I am very proud of! My my husband took 3rd in the Clydesdale division! Pretty cool for his first triathlon ever! 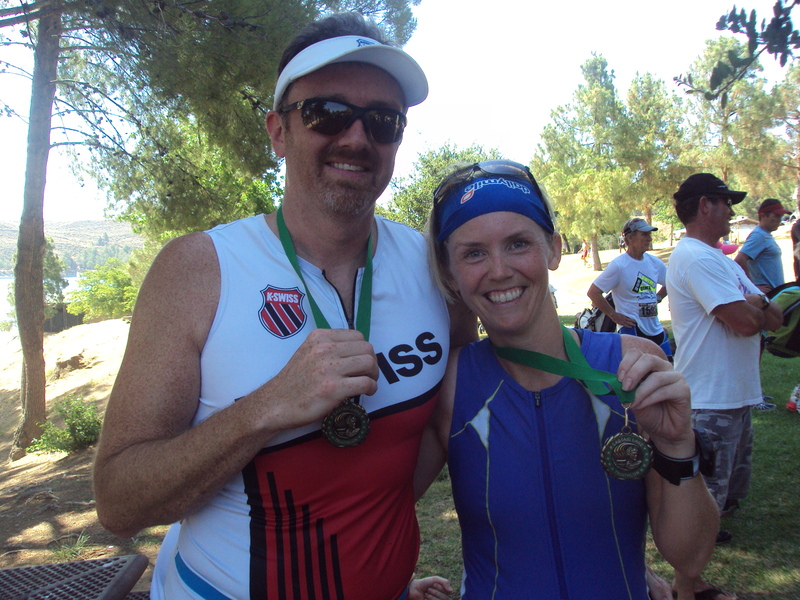 Hubby and I sporting our third place bling. 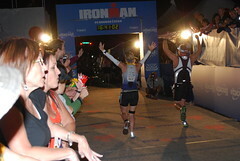 Congrats to both you AND your hubby on a great race! You are so fast and athletic…and inspire me so much. 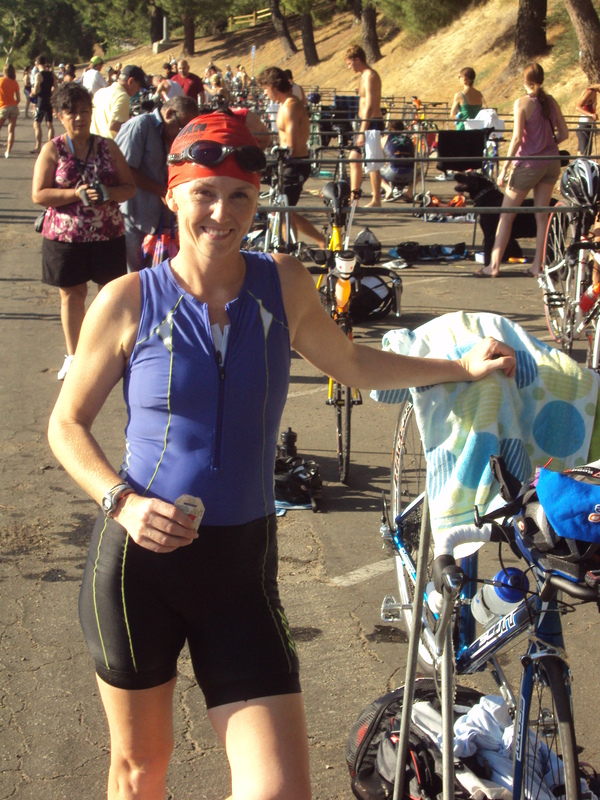 Awesome triathlon report. Thanks for sharing all of your race data. The picture of you and your husband – sharing the BLING – is awesome. CONGRATS. Good Luck and Be Safe at Vineman. Smile. Great job To you and your husband and on your 3rd place finish! You are really dedicated to your training! Wish I could get my husband interested in the sport. Excellent tri! Sounds like a great day for both of you! It was great fun, thanks for inspiring me to try this! Congratulations! What a great spontaneous race, and third in age group! Very nice! You both did so well. I’m going to have to keep this triathlon in mind for the future. Sounds like a fun little race. It was really fun. They are doing another one August 13th. Totally worth it. Nice to support a HS Cross Country team. Aw, I just got an invite to a different function that same day. 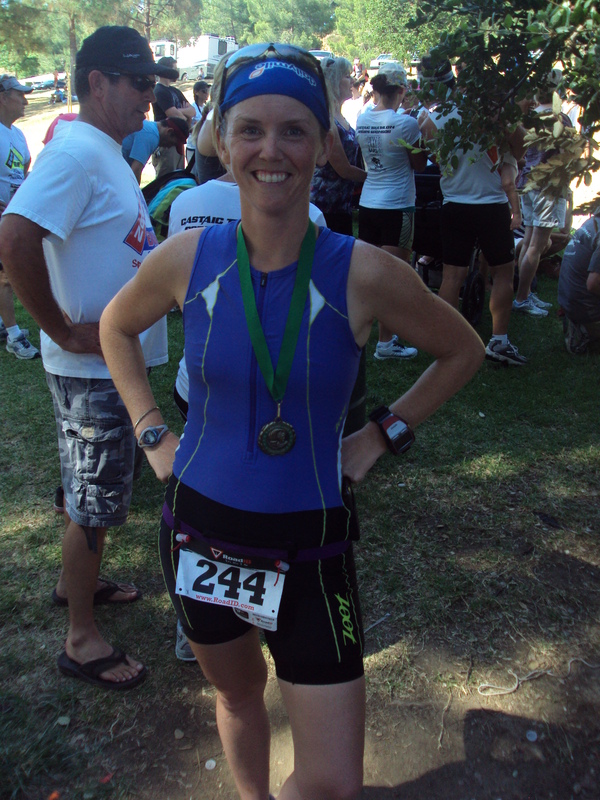 And anyhow, doing a tri the following weekend. But yes, one of my favorite 5Ks is one that supports a HS XC team. Love doing that type of event. Wow, congrats on a super speedy race – I love it when there’s hardware for my efforts! Great job to your hubby, too! Thanks and thanks for the subscription to the blog! So glad you found the blog! We are hoping to be back for the next one in August! It was a really cute race! We will also be at Carpinteria in September. Sounds like you both had,not only a great race experience, but a very successful day! Congrats! I love mixing in smaller grass roots races into my schedule. They are fun and usually support a good cause! Glad you had a good time! Nice job my friend. Congrats to you and your husband. That is awesome and the 3rd place finish probably has him hooked for life now. That is awesome.